Current, curvaceous and cut in the solid wood you like best, the Amish Fairport Sofa Table makes a gorgeous addition in the living room, entryway or hall. Positioned behind your sofa, the Fairport is a great way to add a contemporary element while adding some storage and display space. 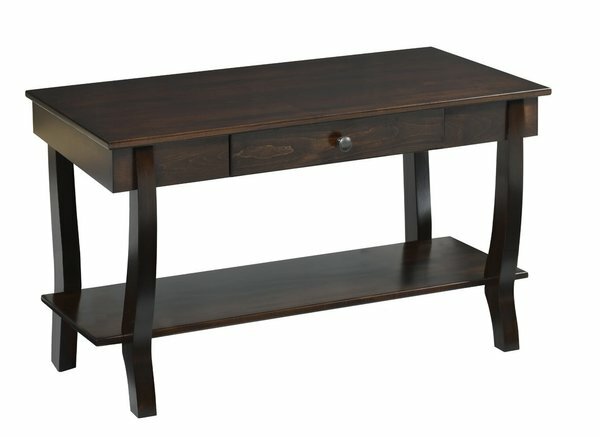 The Fairport Sofa Table features a lower shelf and one drawer and is shown here in brown maple wood with rich tobacco stain. Is this your first time shopping for furniture online? See what people are saying about their experiences with DutchCrafters Amish Furniture in these reviews. Thank you for shopping American made, Amish furniture.